When summer temps reach the 90s, you probably sit inside in air conditioned rooms and welcome the cool air of modern technologies. If you don’t have an a/c, you definitely open windows and have a fan to get that hot air out of the house. Even though cool air isn’t blasting through vents, getting the hot air out and the less-hot air in makes an appreciable difference. Hot air rises, so the fact that your attic gets hot is not a surprise. How hot it gets is quite alarming. On a summer days with temps reaching into the 90s, an attic may reach temperatures of 160 degrees! This can cause multiple problems. The first problem with hot attics is that your energy consumption goes up. If a home does not have good attic insulation, the stress on the air conditioner may increase by 30 percent. Air conditioning work comes from the difference between the temperature inside and the goal temperature, so if you increase the inside (attic) temp, it makes the a/c unit work harder. This costs more money in energy consumption. Even if an attic is insulated, poor ventilation can still lead to increased energy use to get that comfy temp in the sweltering heat. The second problem with hot attics is moisture. Many modern homes are built with a vapor barrier between the attic and the living space, but many vapor barriers are permeable to moisture at some level, and any moisture that gets into the attic is a problem. Moisture that is trapped in the attic will cause rotting to structural components including insulation and wood. That is another reason ventilation is a requirement. Regardless of the type of insulation you have, you need attic ventilation. It is very unlikely that you don’t have it because it wouldn’t be up to code. The International Building Code (IRC) requires attics to have cross ventilation. There are different ways to ventilate the attic. Many homes have sufficient ventilation by using simple vents at the home’s eaves and gables. Cool air enters through the eaves, and hot air is forced out through the gables. It actually creates good air flow…the hot air escaping pulls cool air in. This is called passive ventilation because it requires no motors or active components. It simply relies on natural physics. Some homes have turbines on the roof that act as ventilators by moving hot air out of the turbine and sucking in cold air. This process causes the turbines to turn. Ultimately, you have a fan that doesn’t require electricity, and this works well in many homes. Venting can also be installed along the length of a roof at the peak. As you can imagine, this is very effective, but it is difficult to install. In order to save money, a person should have ridge vent systems installed during re-roofing or during original construction. 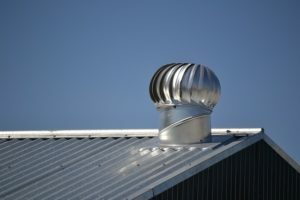 Gable fans are meant to be used in the vents already present in the attic, and those vents are typically large enough to move a good amount of air. They can also be hooked up to solar panels, so they can run on their own without any change to your electric bill or need to personally turn the fans on and off. Do You Need Better Ventilation? As previously stated, it is unlikely that you don’t have some form of ventilation. It is not a new concept, and it is part of building codes. The bigger question is whether or not you have enough ventilation to be energy efficient and whether or not you are a moisture risk. 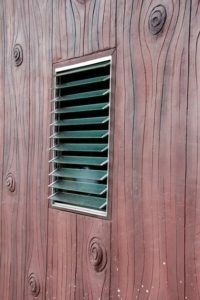 If you don’t have proper insulation and you live in a warmer climate (at least in the summer months), then you may need a ventilation upgrade. This may involve the addition of more vents or the installation of a fan. Likewise, if you live in a humid climate, moisture risks need to be mitigated. You don’t want to find dry rot…ever. Since heat rises, the attic plays a huge role in the energy efficiency of a home. It keeps the heat in during winter months and the heat out during the summer months. This reduces the stress on all climate control systems, whether that be a heat pump, furnace, fan, or wood stove. In older homes with good venting, insulation may be the improvement needed for your home to be more efficient. It will surely be nice for your air conditioning to be able to keep up with your square footage on hot days. However, if you want that system to be efficient, proper ventilation will still be a factor. If you think you need a ventilation fan, call your electrician. Electricians can set up fans that run through on-grid or off-grid sources, and they make sure your fans will keep running through those blistery, hot summer days.